Few people probably expected it was possible, but Lindsay Davenport re-captured her Commonwealth Bank Tennis Classic title with a hard-fought 6-4 3-6 6-2 win over second seed Daniela Hantuchova. 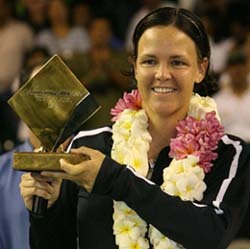 In winning the title, Lindsay has what is probably a unique record in Bali, because she has never left without a title. It is doubtful that she has done that anywhere else, and certainly she couldn’t think of anywhere. On her first visit in 2005 she won the singles, last year she claimed the doubles, and now she’s won the singles again. Having not played for a year, having given birth in June, was she surprised to win in her first tournament back? "I’m a little bit in shock," said Davenport. "It’s just overwhelming and exciting. Obviously, playing my first tournament back I was unsure physically how I would respond, and I swear this is probably the first tournament I’ve played in four years where I didn’t have anything wrong with my lower extremities." There wasn’t much to separate them in the first two sets, with Davenport earning the first break for 2-1 but allowing the Slovak to level in the following game. Hantuchova then held a break point to lead 5-3 but made an error on her forehand, and Davenport took advantage of the let-off by breaking in the next game by making a good return that forced Hantuchova to mis-hit a forehand. The second set was decided by just one break of serve for 3-1, and the final set turned on a one-sided period when Davenport won 15 out of 17 points. "I was definitely getting tired there in the second set but was able to re-group and get a second or third wind for the third set," said Davenport. "That was important and I don’t know exactly where that comes from, but I definitely felt a little bit fresher in the third than I did in the second. "I finally got a lot of confidence and was able to break her to go up 3-1. She threw in a couple of errors and I hadn’t broken her in so long and that really gave me a lot of confidence and momentum. That relaxed me a little bit more in my service games and I was able to make some more first serves." Hantuchova received treatment for a blister on her right heel when down 4-1 and she played more positively after that, but it was too late. "It was just a blister, nothing serious. There’s no excuse," said Hantuchova. "I was trying to do the right things. I think I had the right tactic, which was to move Lindsay around to make her play that extra shot, but all credit to the way she was playing. She was serving great. She got out of trouble a lot with her first serve. "But I had a fantastic week. I’ve really enjoyed it, coming here after the US Open. I was just looking to get some matches under my belt and didn’t really expect to be in the final so it’s really a good one for me." The doubles was won by Chinese pair Chunmei Ji and and Shengnan Sun, who defeated American Jill Craybas and South Africa’s Natalie Grandin 6-3 6-2. San Fernando Valley - In an effort to promote team spirit and provide more league play, the USTA has introduced a new Tri-Level format. 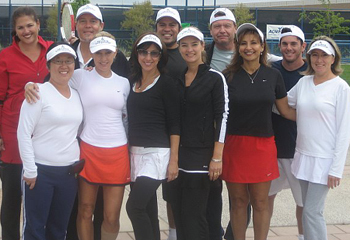 Braemar Country Club in Tarzana and Paseo Tennis Club in Valencia have formed new USTA Tri-Level teams. Each team consists of 4.5, 4.0, and 3.5 players. 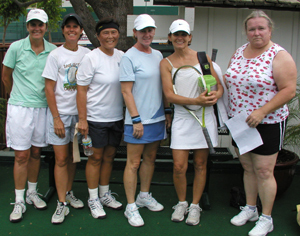 The league winners will advance to Sectionals at Indian Wells in February 2008. These teams will also be eligible to play in the Invitational National tournament next March during the Pacific Life Open. Braemar Country Club - (L to R) Debby Moss, Lety Alcala, Karen Mendelson, Suzy Miller, Patsy Rowan, Diane Perryman, Lisa Gechtman, Tiffany Grana, and Captain PJ Rivera. Not pictured - Lee Gummeson, Cynthia Neiman, Julie Perron, and Elisa Hamed. Long Beach - The USTA District Area Playoffs July 27 - 29, 2007 at El Dorado Park in Long Beach. 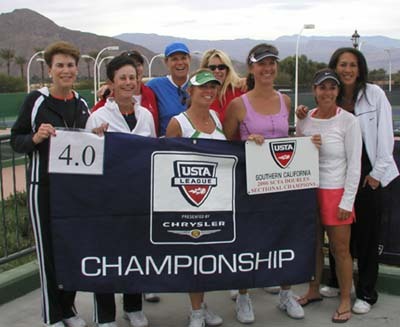 Winners advance to the Southern California Sectionals August 17 - 19, 2007 at Los Caballeros Sports Club, Fountain Valley. Starting in 1927, the Countrywide Classic has gone through more than just a few name changes. 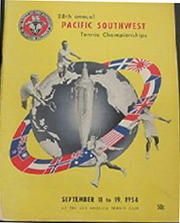 The tournament was first known as the Pacific Southwest Championships. For five decades it was an amateur only event, in line with the Grand Slams. 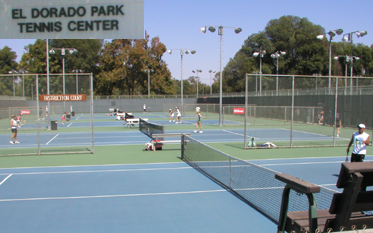 Until 1984 it was held at the Los Angeles Tennis Club. This prestigious club is still located on Clinton St. It's a strictly traditional club, much like Wimbledon. When Billie Jean King was just twelve years old, she was excluded from a group picture at the LATC because she was wearing tennis shorts instead of a tennis dress. The Pacific Southwest tournament had an 'intimate feel'. Jack Kramer recalled in his autobiography that he not only played the greats of men's tennis at the time, but also players from the UCLA and Southern California teams. That must have been a great learning experience for all concerned. To put this all in perspective, the PSC was at least the third most important tournament in the West, and the biggest outdoor hard-court tournament in the world! Remember, at this time, Roland Garros (the French Open) was the only Grand Slam not to be played on grass. Now for a bit of mystery and detective work: Just when did the 'Powers that Be' allow professional players to compete with the amateurs? The evidence seems to point to the 'Open Era'. This was in 1968 and the new rules allowed Pros to play in the Grand Slams along with amateurs. Obviously this was a great change in international, as well as domestic, tennis. Although there is no definitive answer, all the evidence points to around this time. Rod Laver turned Pro in 1962, and he won the Men's Singles Title in 1968. There's more history of the Countrywide Classic to come! It's just too big a story to put in one little article, and during the build-up to this fantastic ATP event, expect more articles about the history and some of the fantastic Californian tennis players that have made this event what it is, one of the best. The first Californian born men's singles Champion of the Pacific Southwest Championships, held at the Los Angeles Tennis Club, was Henry Ellsworth Vines, Jr. His friends called him 'Elly', but the media christened him 'the Californian Comet'. He won the tournament two years running, in 1930 and 1931, before being beaten by Fred Perry. He is still known as one of the greats of men's tennis. The next 'homegrown' Champion (for anyone that has knowledge of California Tennis) needs no introduction; John Donald Budge. Known by the world as Don Budge, he is the first tennis player from the University of California in Berkeley to win this great hard-court event. An interesting article could be written just about this Californian tennis legend, so perhaps later. Then comes the infamous Bobby Riggs. More remembered for the "Battle of the Sexes" against Billie Jean King, his status as the top male singles player for three years running seems to have been eclipsed by that event. Jack Kramer, in his 1979 autobiography, noted that he thought Riggs was in the top six of men's singles tennis players of all time, even bettering Pancho Gonzales. So, what about Pancho Gonzalez? Even his name invites controversy. Wikipedia says he was born 'Richard Alonso Gonzalez', though there are many variations to the spelling of his last name, as well as his first. Let's just call him Pancho. He was reportedly the 'McEnroe' of his day, using rage as a means to an end. Early in his career he used it to propel his game, but later it became a stalling tactic, according to some. Whatever, he was still a formidable fighter, even pushing the limits of his capability in the Fall of his career. Here he was, aged 41 and a grandfather by all accounts, going to Wimbledon in 1969, and playing Charlie Pasarell in the first round of the men's singles. The match lasts 5 hours, 12 minutes. Pancho saves 7 match points in the 5th set, and wins by 22-24, 1-6, 16-14, 6-3, (and eventually) 11-9. This Wimbledon record remained for 21 years, when Micheal Chang and Stefan Edberg played another 14 minutes longer in 1992. New rules were introduced to stop this kind of match marathons from happening again at Wimbledon, but there still could be another record-breaking men's single match, although that is highly unlikely. Pancho was one of a kind, but still an inspiration to young players everywhere. Cheri Britton is the editor of http://www.womens-tennis-apparel.com/ . Her passions are ladies tennis apparel, tennis, and the promotion of the game of tennis worldwide. She also watches far too much tennis than is good for her. Southern California made quite the splash at last months World Team Tennis Recreational League National Qualifier in Las Vegas, garnishing two teams with national finals bids in November. At the 4.5 division, captain Julie Tinius-Juliani of Studio City led her team, Aces Up, to an undefeated 5-0 on the outing, while captain Emily Bonnet’s 3.5 team (of Woodland Hills), We Hate Late, earned their very first trip to the WTT National Finals, also finishing unbeaten at 5-0. Tinius-Juliani’s team had just one close match, winning 25-23 over Paseo, though the rest of their matches were won somewhat effortlessly in the nine-team division. On their way to the finals, Aces Up recorded an unbelievable 36-0 demolition of team Bainspiration; it was the tournaments lone shutout. In the finals, Aces Up took out the Calabasas Challengers 30-24. Having qualified for Nationals at Indian Wells in November, Aces Up will have to face tougher, more seasoned opponents. But Tinius-Juliani has no doubt her team will be up to the challenge. The 3.5 team, We Hate Late, completed their flight with a perfect 3-0 record, good enough for the No. 3 seed heading into the next round. In the quarterfinal match against wildcard team Ray, Bonnet’s team barely scraped by, emerging the victorious 30-29. En Route to a Division crown, team We Hate late dispatched the No. 2 seed Parque Central 30-26 and Team Krunk in the finals 31-27. 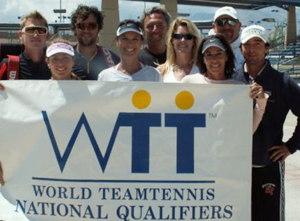 For those not entirely familiar with WTT Recreation League play, it is co-ed teams competing in a format that consists of six no-ad sets: one set each of men’s and women’s doubles, followed by men’s and women’s singles, and ending in two sets of mixed doubles. 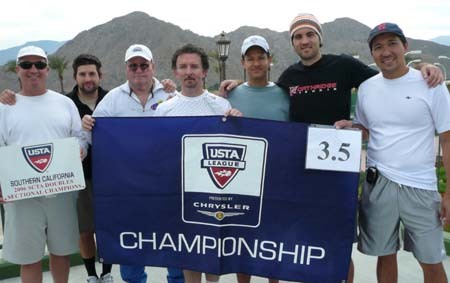 Each team must have at least two men and two women (18 and over) on the maximum 10-player roster, and the divisions are broken up much the same way that they are in USTA-play, by NTRP rating. Though determining a team’s overall rating is quite different; the average NTRP rating of the top two men and top two women players on a team determine the team rating. Aces Up captain Tinius-Juliani likes the differences and feels that her players enjoy it as well. For the match score breakdowns on all the teams in the Las Vegas Qualifier, please click here. Indian Wells, Ca., March -- The 2007 Pacific Life Open, achieved a record attendance of 303,398, the first time any non-Grand Slam tournament has broken the 300,000 mark. In addition, the tournament set a single-day attendance record of 20,741 during the day session on Sunday, March 11. The attendance records headline a list of other milestones that were set throughout the two-week event. A few of the record-setting highlights include the tournament being televised for more than 2,000 hours in over 200 countries around the world; more than 400 local, national and international journalists and photographers were onsite covering the tournament; travel package sales rose an impressive 37% compared to last year; www.PacificLifeOpen.com had more than 1.75 million unique visitors over the course of the two weeks; there were 200 challenges on Stadium Court with regards to the new Electronic Line Calling system, with players winning 39% and losing 61% of the time; the tournament being named the 2006 Sony Ericsson WTA Tour Tournament of the Year by the players for the second year in a row; and more celebrities than ever before came out including Melinda and Bill Gates, Gwen Stefani, Gavin Rossdale, Elizabeth Shue, Dr. Phil, Tommy Bahamas model Andy Lucchesi, Pacific Life Open owners Billie Jean King and Chris Evert, Greg Norman, Barbara Sinatra, Jeanette King and Boris Becker. The 2008 Pacific Life Open will be held March 10-23. Under another hot desert sun, No. 2 seed Rafael Nadal grabbed the first Master’s Series title, beating No. 12 seed Novak Djokovic 6-2, 7-5 at the Pacific Life Open. After a less than satisfactory first set performance by Djokovic, the two players battled it out in the second set, exchanging long-winded points and exciting the crowd with amazing winners. At the start of the match, Nadal played the role of the aggressor, demonstrating why he deserves the status of the second best player in the world. Djokovic was playing in just his first final of this caliber and he felt a little nervous, naturally. Many of the fans were becoming restless towards the end of the first set, as it looked as though this would be a quick final for Nadal, but when Djokovic began to relax and play more of his style of play successfully, the crowd responded wildly for both players. At on point, Djokovic’s (who hit an embarrassing 22 percent first serve percentage in the first set) serve was called out. Unhappy with the call, Djokovic decided to challenge it. As the replay slowly revealed the flight of the ball, it eventually landed what looked to be just next to the service line, though out. However, upon closer look and a 3 times magnification, the monitor showed the tiniest of portions of the ball was actually in, shifting the momentum Djokovic’s way. 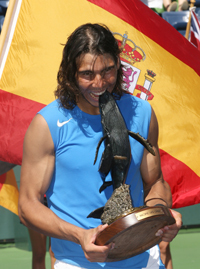 For Nadal, who has won numerous finals appearances, picked up his first Whale trophy at the Pacific Life Open, adding another tournament victory to his already impressive resume. Nadal also had one of his best serving performances of his career, not dropping serve the entire tournament. After the match, both players met at the net for a warm embrace. After all, both of these players are not even of legal drinking age and already represent the next generation of tennis players. Djokovic said he looks forward to another opportunity to play the Spaniard, and Nadal expressed similar plans. Nadal’s ability to take the other players style of play out of the equation and control the tempo of play is unlike many players on the Tour today (well, with the exception of the immortal Roger Federer), and for Nadal, that may be the key to his early career success. The women’s finals showcased the consistent-play of Daniela Hantuchova against the match-experienced Svetlana Kuznetsova. Hantuchova, who won this event in 2002, which coincidentally is her last WTA title, came out playing as if she had something to prove. Hantuchova’s win was quite impressive after noticing that going into this match, her record against Top 5 players was just an abysmal 3-25, with all three of those wins coming against the No. 4 ranked player. 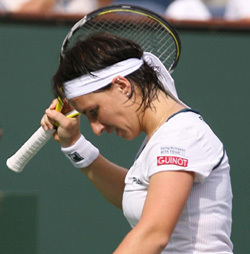 Kuznetsova, however, came out looking noticeably flat, committing several unforced errors and showing signs of defeat. Despite Kuznetsova’s efforts, Hantuchova proved to be the better player on this day, winning in straight-sets 6-3, 6-4. Despite the loss, Kuznetsova will reach a career-high No. 3 in the WTA rankings just for reaching the finals. Matt Osias can be reached at mosias@californiatennis.com. The winning section of the first annual Pacific Life Open Tri-Level National Championship, a doubles competition with 120 participants representing eight different United States Tennis Association (USTA) Sections from 14 different states, was the Southern California Tennis Association (SCTA). 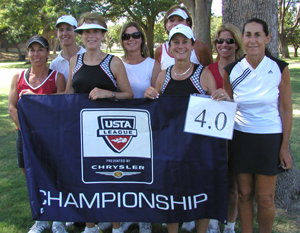 Each USTA Section team was comprised of 12 members (six women and six men) providing for one doubles team per gender in the 3.5, 4.0 and 4.5 ability levels. The SCTA received a Baccarat trophy and the members of the team were each awarded a one-year clothing contract from Fila. Southern California Doubles Sectional Champions - San Fernando Valley Chargers - 3.5 doubles team. Indian Wells - The 4.0 women's team representing the San Fernando Valley from Braemar Country Club plowed through the field to win the Fall Southern California Sectionals. The team went undefeated beating Laguna Niguel, Balboa Club in San Diego, Lakewood, and then Whittier Narrows from San Gabriel Valley in the finals. L to R - (Back Row) Cynthia Neiman, Nancy Abrams, Karen Cohen, (Front Row) Joan Saltzman, Caryl Stalmaster, Ellie Harris , Julie Juliani, Diane Perryman and Captain Bobi Williams.